Welcome to our comprehensive review of an electric fireplace with mantel, the Dura Flame 23IRM1500-O107. Important Note: In our research we discovered that Amazon lists this fireplace as a ClassicFlame and the description then starts talking about a DuraFlame. It is actually a DuraFlame electric fireplace. The confusion is that the parent company Twin Star International markets electric fireplaces under several names including both ClassicFlame and DuraFlame. A call to customer service at Twin Star and getting hold of an owners manual verified this to be a DuraFlame brand electric fireplace. 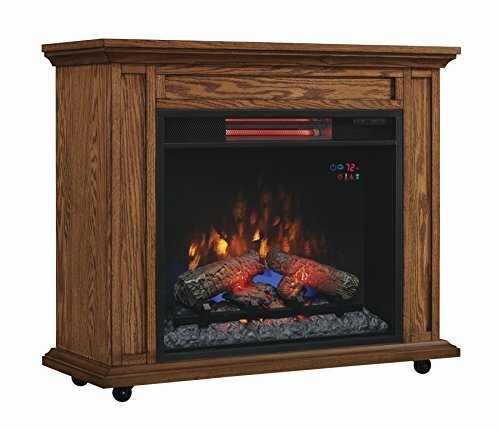 So that you have all of the most important information that you need to decide on a purchase, you will find all of the essential features and benefits in this ClassicFlame 23IRM1500-O107 Rolling Mantel with Infrared Quartz Fireplace review. At the end of the review we honestly reveal the pros and cons about the unit that are summarized from actual buyer experiences. This is a rolling mantel that has lockable rolling casters with a really classic design that will look good in every room in your home. The casters ensure complete mobility with this unit and the infrared heater provides moist and safe heat for your rooms. this an ideal choice if you are implementing a zone heating plan in your home. This will surely heat your bedroom at night so you can knock the house thermostat down. We love, love, love the flame effects. This puppy has many different flame color combinations and brightness levels. Powered by the energy efficient LED Spectrafire™ Plus technology, the flame effects of this rolling mantel are realistic looking. The speed of the flames can be adjusted up to five levels so that you can enjoy a flickering flame right up to a fast roaring fire. You can also choose from five flame effect colors which include Midnight Fire, Spectrafire, Campfire, Amethyst and Sapphire. Create 125 different flame effect combos.The colors can also be set to auto cycle. The rolling mantel comes with a traditional log layout with an ember bed. The flame effects can be operated without the need for the heater to be switched on so you will be able to enjoy the flames 365 days of the year. The LED’s that power the flame effects are very long lasting and will not need to be changed. The heater in this rolling mantel can generate up to 5200 BTU’s and is an ideal supplemental heat source for a room up to 1000 square feet. An infrared heater is used which will result in a moist and comfortable heat that will not dry out the air in the room and will maintain the natural humidity. See this post for understanding how infrared electric fireplaces work.The heat is delivered through the top of the firebox. If you use the heater and flame effects together it will cost around 10 cents per hour. The rolling mantel plugs in to a standard 120 volt electrical outlet. There is an adjustable thermostat with this heater allowing you to set the desirable temperature for the room you are in. You can control the temperature from 62° to 82° Fahrenheit (in increments of 2 degrees). The front of the firebox has a tempered glass display which should never get hot so young children and pets will be safe. There is a timer facility where the heater can be shut off automatically. The timer can be set from half an hour up to nine hours. The rolling mantel can be controlled from touch controls on the firebox or through the remote control that is supplied. This infrared electric fireplace comes with a multifunction remote which offers you the ability to customize your electric fireplace mantel with 125 selectable flame effect options to create the perfect mood and ambiance for any style. Or choose auto cycle then sit back and enjoy as the different flame effects rotate through automatically. There is an on / off control and a digital temperature readout. The speed of the flames can be adjusted to five levels and the brightness of the flames can be changed. Also you can control the temperature of the heater output and set the timer to auto shut off the heater. The ClassicFlame Rolling Mantel is 33 inches wide by 28 inches high and 13 inches deep. The product only weighs 39 pounds which means that it is very portable. The product is supplied with a power cord that is around 4 feet long and there is a remote control and a user manual included in the package. The rolling mantel does not require any assembly. A lot of the customers were very happy with the way that the rolling mantel fireplace looked. There were a lot of comments about how good the unit looked in their homes. The wooden mantel was commented on as looking very stylish and some said that it “looks awesome”. They liked the portability and light weight that the rolling mantel offers. Many stated that they were able to use the fireplace in a number of different rooms with no hassle. The wood and flame effects have been described as “beautiful” and many thought that the flames looked very realistic. The flame effects have been described as “very cool” and people liked the range of adjustments for different colors, flame speed and the brightness levels. One person said that the flames provide “great ambience” for their room. “Not having to assemble this unit is a big plus” – a lot of customers were happy that there was no assembly work required other than fitting the casters. People said that it was very quick to get the fireplace up and running. “The rolling mantel was broken or damaged” – there were a couple of customers that reported that their rolling mantel was broken or damaged when it arrived at their home. This can happen to anybody and a replacement can be easily obtained. That is an advantage about buying from Amazon. This should not deter you from buying this unit. “The heater is very noisy” – one customer commented that the heater was very noisy when it was switched on. This was a one off comment as several people thought that the heater was really quiet. This could have been a faulty unit and is not considered to be a major problem. “Flames are not that realistic” – one person felt that the flames were not very realistic looking. This was definitely contrary to the majority opinion where the flames were considered to be realistic. A number of reviews have been submitted for this product and 72% of the reviewers gave this rolling mantel a 5 out of 5 star rating. Another 13% of the reviewers awarded the product 4 out of 5 stars and the combined total is a credible 85%. This is a well priced rolling mantel that looks good and has a lot of features. The infrared heater is efficient and does not dry out the air. The unit is portable and requires no assembly. This rolling mantel is a recommended purchase.